The stories of 1950s romance comics are great, but so are the filler pages! 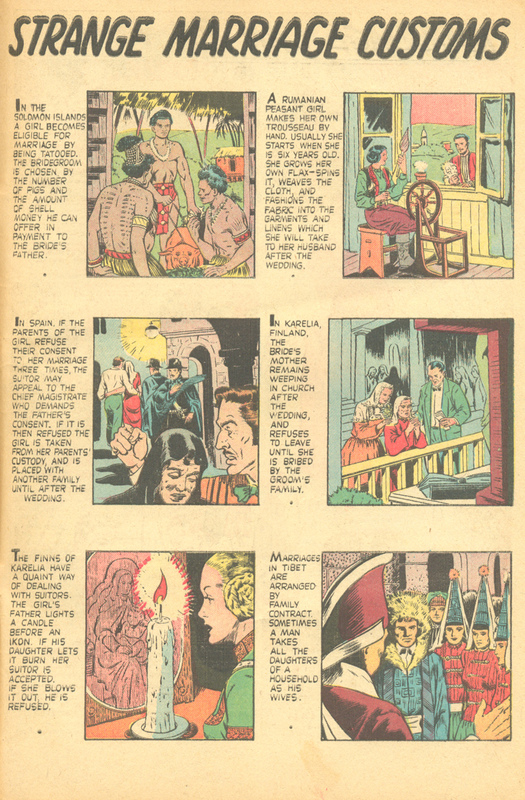 The four pages below hail from Romantic Marriage #6 (October 1951) published by Ziff-Davis. Collectively, the messages of the filler material do not really bode well for marriage -- especially these first two cartoon pages called "Wedding Belles." "Marriage Can Be Fun!" is definitely on the sunnier side and depicts marriage as an exciting and rewarding partnership. Very different from the previous two pages which just make the institution of marriage sound like a drag! "Strange Marriage Customs" is well... a bit strange, but I wouldn't say a rarity. Quite a few romance comics into the early '60s featured pages uncovering courtship rituals of "primitive" people. Thanks for joining me for another fun Time Travel Tuesday! I always look forward to it!